Beto O’Rourke speaking at UNC. Photo via Blake Hodge. 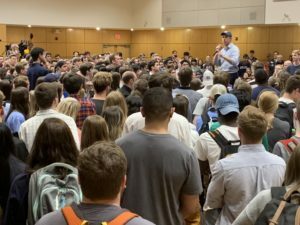 Beto O’Rourke brought his campaign for the Democratic nomination for president to Chapel Hill on Monday, and it didn’t take him long to connect with the crowd at the Student Union on UNC’s campus. The line of those hoping to attend the event had wrapped around the building waiting for O’Rourke earlier in the afternoon. The candidate, meanwhile, was traveling across the Tar Heel State, with stops in Charlotte and Greensboro before Chapel Hill. O’Rourke stood on a podium in the middle of the crowd, speaking with his patented energetic delivery and accompanying hand motions. The El Paso native, who represented the border town in Congress as a member of the House of Representatives from 2013 through 2019, continued his calls for inclusion while delivering segments of his address in Spanish. To reach a more inclusive democracy, O’Rourke called for the elimination of gerrymandering in drawing political districts and for increased voter registration efforts. When speaking about health care policies, an attendee asked O’Rourke why he didn’t support a single-payer model, saying that the country did not have time to waste for those who are dealing with illnesses. Rounding out issues that are likely to be included in the Democratic primary debate, O’Rourke focused on climate change as one of the greatest challenges facing policy makers. O’Rourke rose to national prominence in his failed race for the United States Senate in 2018 when he lost to incumbent Republican Ted Cruz. He is now running in a crowded field of Democrats looking to take on Donald Trump in the run for the White House in 2020. The Democratic primary in North Carolina is scheduled for next March.